Absinthe. Supposedly in its lethal version, a taste of "the green fairy" will make you hallucinate, which is why it was illegal for so long in Western countries. 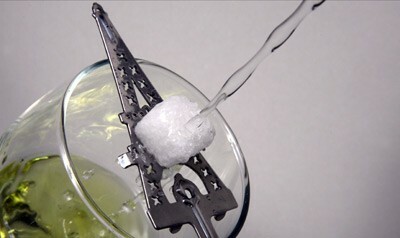 Two years ago, the prohibition of absinthe in the United States was lifted. "The new rules allow real wormwood-flavored absinthes to be sold as long as they contain only small amounts of thujone, the wormwoody compound long thought to be responsible for any psychoactive qualities the old absinthes may have had." I've got two small bottles of the stuff in my cupboard at home. A friend brought home a set of three that he picked up on a stop in Germany on his way back from Iraq. That was almost two years ago. We tried the first bottle the first night. Yuck. That's why the other two are still in my cabinet. Read up more on absinthe in this WSJ.com article. Or see a feature from food writer Tricia Childress here.